Vitamin A promotes normal growth and development; tissue and bone repair; and healthy skin, eyes, and immune responses. Good sources include milk, cheese, eggs, and yellow-to-orange vegetables like carrots, yams, and squash. Vitamin Bs. The family of B vitamins -- B2, B3, B6, and B12 -- aid metabolism, energy production, and healthy circulatory and nervous systems. Good sources include meat, chicken, fish, nuts, eggs, milk, cheese, beans, and soybeans. Vitamin C promotes healthy muscles, connective tissue, and skin. 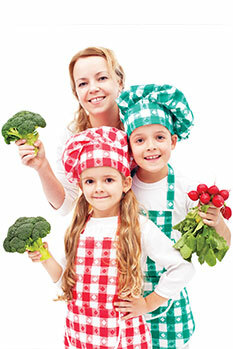 Good sources include citrus fruit, strawberries, kiwi, tomatoes, and green vegetables like broccoli. Vitamin D promotes bone and tooth formation and helps the body absorb calcium. Good sources include milk, cheese, and yogurt (especially fortified dairy products), egg yolks, and fish oil .Calcium helps build strong bones as a child grows. Good sources include milk, cheese, yogurt, tofu, and calcium-fortified orange juice. Iron builds muscle and is essential to healthy red blood cells. Iron deficiency is a risk in adolescence, especially for girls once they begin to menstruate. Good sources include beef and other red meats, turkey, pork, spinach, beans, and prunes.